With the 2018 LA Auto Show debut Wednesday of the 2020 Gladiator, Jeep is back in the pickup truck game. The 2020 Jeep Gladiator pairs the Wrangler’s swagger to a more utilitarian form just as the mid-size pickup wars heat up. Don’t look for the 2020 Gladiator to be a back-to-basics pickup. Its Sport, Overland, and Rubicon trim levels build on three degrees of capability. From the rear seat forward, the Jeep Gladiator is largely identical to the four-door Wrangler. Instead of grafting a bed onto the Wrangler’s body, however, Jeep stretched the Wrangler’s wheelbase by 19.4 inches and added another foot behind the rear axle, bringing its overall length to about 218 inches. That doesn’t help with its breakover and departure angles, but the five-foot steel bed offers open-air utility and can be augmented with an optional bedliner, 115-volt power outlet, bed divider, and tonneau cover. The Gladiator’s spare tire sits under the bed rather than attaching to the tailgate. Jeep left enough room between the ladder frame’s rails to accommodate a 35-inch tire. Like the Wrangler, the Gladiator can be fitted with a fabric top or a composite hard top, either of which can be removed for open-air driving. The Gladiator’s windshield folds flat like it does in the Wrangler, too. All trim levels come standard with a 3.6-liter V-6 rated at 285 horsepower paired to a 6-speed manual transmission. An 8-speed automatic transmission is optional. In 2020, the Gladiator will offer a 3.0-liter turbodiesel V-6 rated at 220 hp and a hefty 442 pound-feet of torque. The standard Wrangler’s available turbo-4 won’t be offered in the Gladiator. 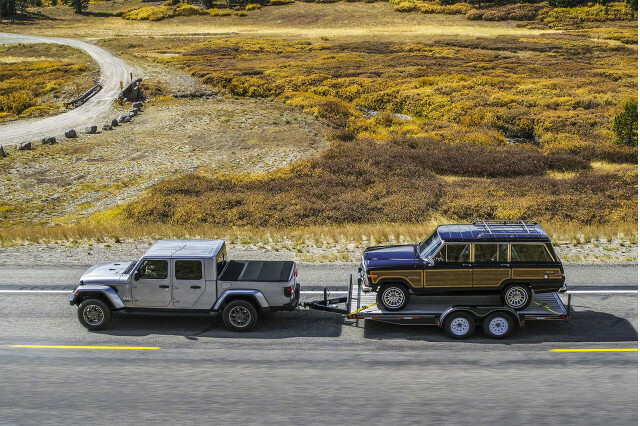 With an optional tow package, the Sport trim level, and the 8-speed automatic transmission, the Gladiator’s V-6 is rated to lug a 7,650-pound trailer. Payload ratings vary from about 1,110 to 1,600 pounds depending on trim levels, transmissions, and axle ratios. Underneath, the Gladiator includes Dana 44 front and rear axles. Gladiator Rubicon models feature wider versions of the Dana 44 with locking differentials, electronic sway bar disconnects, and upsized 33-inch off-road tires. 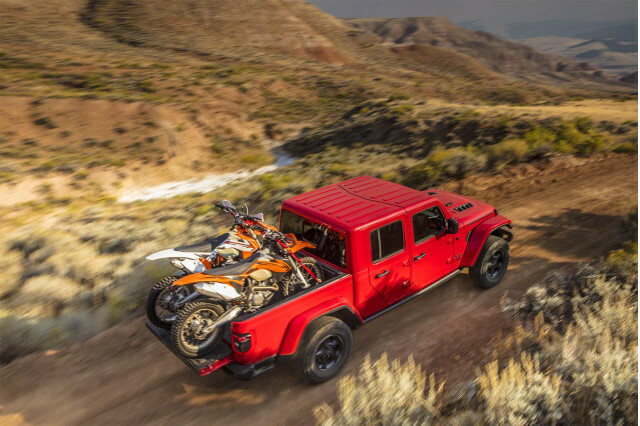 Unlike the Wrangler with its available full-time four-wheel drive, the Gladiator will only be available with a part-time, four-wheel-drive, two-speed transfer case not intended for use on dry pavement. Gladiator Rubicons feature a beefed-up transfer case with a different low range for serious off-road use. Unlike its closest competitors—such as the Ford Ranger, Toyota Tacoma, and Chevrolet Colorado—the Gladiator’s suspension features solid axles suspended by coil springs both front and rear. The Gladiator’s interior will be familiar to Jeepers since it’s largely plucked from the Wrangler down the standard roll-up windows on the Gladiator Sport. 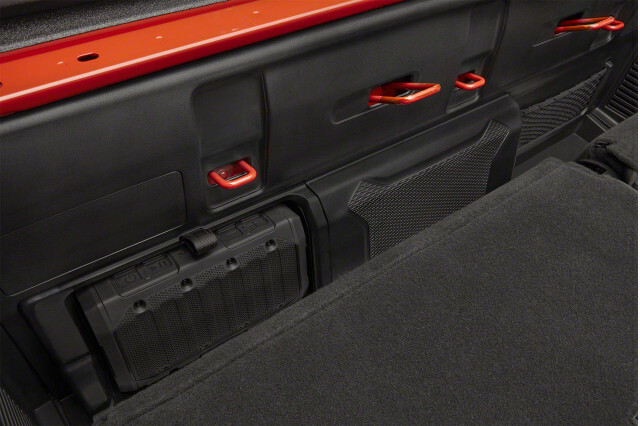 As on the Wrangler, the Gladiator’s doors can be removed with a Torx screwdriver included with the truck. A 5.0-inch touchscreen for infotainment comes standard on the Gladiator Sport. Overland and Rubicon trims swap in a 7.0-inch screen with Apple CarPlay and Android Auto compatibility and offer an 8.4-inch display as an option. The Gladiator offers up to six USB ports including two USB-C hookups. Tucked into the Gladiator’s instrument cluster is a 3.5-inch TFT screen. A 7.0-inch screen with more configurability is optional. The Overland nameplate is new to Jeep’s body-on-frame lineup, but it largely builds on the Wrangler Sahara trim level. Cloth upholstery is standard, while leather is optional. 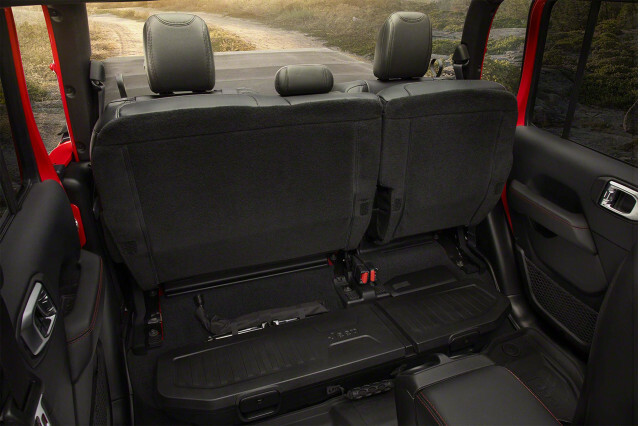 The Gladiator’s rear seats fold flat to reveal small storage spaces against the back of the cab or they fold up like stadium seats to open up hidden bins. One surprising omission is automatic emergency braking, which isn’t available on any Gladiator. A pair of option packages bundle active safety gear such as parking sensors, blind-spot monitors, adaptive cruise control, and lane-departure warnings. Jeep has not announced pricing for the 2020 Gladiator, which is set to go on sale during the second quarter of 2019.